A company that sells applications designed to help production teams plan lighting for stage productions, movies, television shows and events has introduced an academic edition of its flagship program. CAST Software's new wysiwyg Student Edition is intended to help students learn lighting, laser and video event design on professional-grade software. The company already offers a student edition of Vivien, a 3D event design and planning program for event professionals. 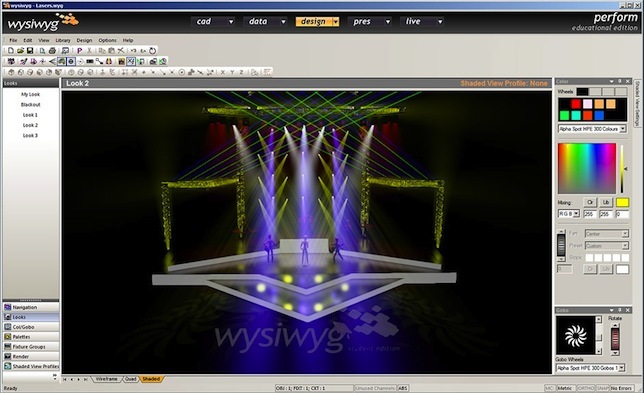 wysiwyg allows users to design, pre-cue and play back lighting sequences; show a 3D simulation of their lighting ideas; and produce lighting plots and reports with fixture schedules and other details. The program includes access to a library of lighting-related objects and features. The student edition of wysiwyg runs on Windows for one year after registration and grants the user access to technical support and membership in the company's user community. Anything paid for the license can also be applied to a full version of the program as well one time. CAST said that wysiwyg was already in use at 400 educational institutions worldwide. Among those are Baltimore Community College, Middle Tennessee State University and Penn State School of Theatre.